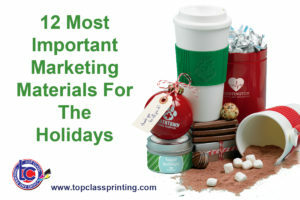 Marketing materials for the holidays is a must for any business. It’s that time of the year again, the holidays season. This is a very important season for retailers and businesses. Many account the holidays for as much as 40% of their revenue for the year. For small businesses to stand out from all the noise from big companies’ advertisement during the holidays, it is important to start early. Staying top of mind and spreading awareness early during this busy season is key in retaining customers and increasing sales. Calendars are a great and inexpensive way to stay in front of clients and prospects all year long. People love free calendars and use them around the office and their house. Make sure to print your full contact information on them to make it easier for clients and prospects to reach you. Also, a full color custom calendar is always best to keep your branding uniform and display your services or products. During the holidays, banners are a great marketing tool to promote your business. You can hang your holidays banners in your store, in the front of your business, or use it at shows. Custom printed hang tags are a very inexpensive way to make your holidays gifting unique, branded, and personal. You can get very creative with the design and add a special touch to show your customers you care and thank them for their business. Posters are a great way during the holidays to advertise specials and seasonal products or services. You can put the posters inside your business, on the front store window, and around town. Full color printed posters are inexpensive and great for holidays marketing. During the holidays use booklets to create products catalogs and advertise. Try to pass them out early to get the most for your investment. Holiday catalogs can be mailed, given with current orders, and left in your store as well as around town. Full color catalogs are great marketing materials for the holidays. Holidays greeting cards are a classic for the holidays, both personal and for business. In an era when everyone is going digital, stand out with a full color printed greeting card to say “thank you” to family, friends, coworkers, vendors, and clients. For family and friends holiday greeting cards family portrait pictures cards are very popular. For business stay on brand while showing some personality. Reward cards are great for the holidays to incent clients to spend more while they save or win incentives. Custom printed plastic reward cards are great to increase your sales total per order by upselling and creating customer loyalty. Gifts certificates are a great way to increase sales and insure future business. Businesses like salons, restaurants, and retailers should offer gift certificates. They are also great holidays socks stuffers. The holidays are a time for parties and celebrations. Custom full color invitations are a great option for personal parties, business events and charity events. Order your holidays party invitations early to make sure your guests receive them on time. Stickers are great to add a special, affordable, branded touch to your holidays marketing. Use custom stickers as discounts stickers, gifting stickers to close gifts, or even to give out with orders. For example, a pediatrician, can use custom holidays stickers; they are a great and fun way to brand and market their practice. Postcards/flyers are a great holiday marketing material. They are inexpensive to print and mail or design them to drop in every current order or leave around town. Offering a coupon code on the card will help increase your chances for sales. The holidays is the season for celebration and fun. A social media frame will make your event more fun and create a social media buzz during the holidays. Check out our Santa social media frame here. Customers are ready to shop from October to December, so make sure to start your holidays promotions early to increase your sales during the holidays. Ordering your marketing materials for the holidays is important to avoid delays and be prepared.